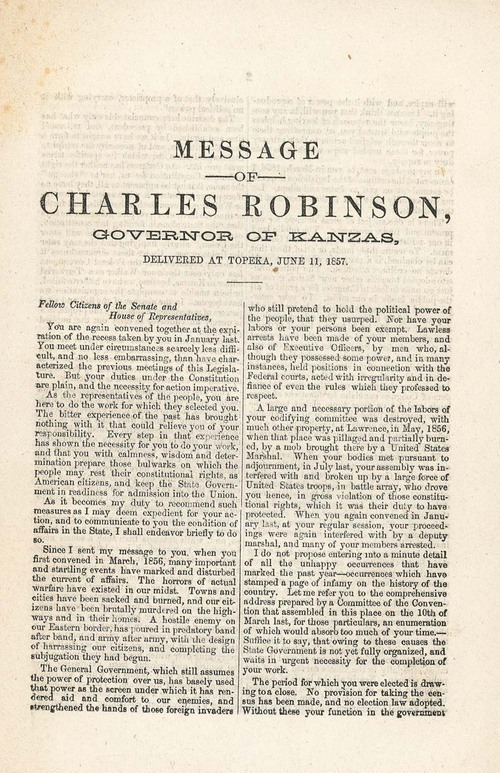 Charles Robinson addressed his remarks to the Senate and House of Representatives that met as the extra legal free state legislature during 1856 and 1857. He reviewed the violence that had occurred since the legislature first convened in March, 1856. He also indicated that since their terms would soon expire, the legislature needed to pass an election law and make provisions for a census, otherwise the free state government would no longer exist if it had not formal procedures for continuing. The address included several statements about how the officially recognized government was usurping its powers.